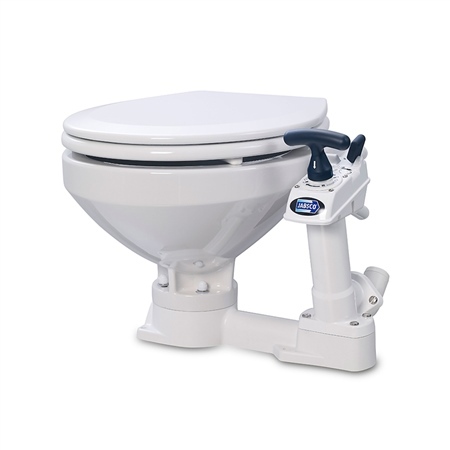 Jabsco's Twist n Lock Manual Marine Toilet has undoubtedly been one of our best selling products over the past 5 years and incredibly popular with leisure sailors and commercial boaters alike. Bearing in mind that Jabsco are the worlds biggest manufacturer of small craft marine toilet systems, and with that a wealth of experience, you can be assured of quality. The most notable feature of this manual toilet is its Twist n Lock function - an action handle which seals down the toilet seat and protects against syphonic flooding and waste backflow. Its simple and intuitive, one easy turn of the handle and the lock is applied. Turni the handle back to the natural operating position the lock re-opens. Other features include... - White glass china bowl with enameled wooden seat and cover. - Reversible pump mounting meaning you can install the toilet for left or right-handed installation. - Simple design with hygiene in mind; crevice-free contours and smooth moldings. - Multi-angled discharge elbow for ease of installation. - Corrosion-resistant materials for fresh or salt water. - All fastenings face front or top for ease of maintenance. Specifications - Connections: for 19mm (¾”) bore inlet hose, 38mm (1½”) bore discharge hose - Dimensions: 470mm wide, 480mm deep, 350mm high (compared with compact bowl model) - Weight: 10.80 Kg - See product datasheet PDF below for full dimensions. Can you put in toilet paper? A: Yes. Use standard supermarket basic products or branded basic products that break down in water. Extra soft or Cushion types are not recommended. Click here to view product datasheet and dimensions. Due to the fragile nature of this product, delivery cannot be made to addresses outside the UK and cannot be made to those with the following GB postcode prefixes: BT1-BT99, GY, IM, JE, PO30-PO41, TR21, TR25. This toilet was bought to replace a TCM model that was old and worn. The jabsco regular is a much better type than my old one. The jabsco is slightly taller to sit on. The seat itself looks almost normal household size. The toilet base is slightly bigger with different hole positions than my old one, but seems very stable and robust. The pipe connection positions were almost identical to the old one. Flushing is very easy and follows the usual format with the added extra of locking ability. Everything is a positive with this jabsco toilet. Lots of stars given. A good quality, easy to use and install toilet. So far so good!